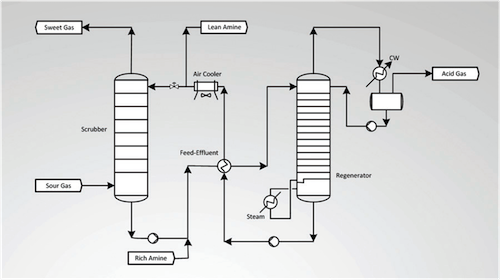 Editor’s Note: The following article discusses amine systems and is primarily applicable to refineries and gas plants. It is provided here to increase the overall knowledge of and appreciation for these systems by inspectors, (especially those with API 571 certificates) and corrosion engineers. Information like this can assist in knowing where and why to inspect for corrosion in these systems. Rapid fouling of heat transfer equipment in amine scrubbing systems reduces performance, especially during the hot summer season. Engineered temporary cooling solutions can deliver ideal process conditions in critical periods of the year with little-to-no production interruption. Furthermore, the immediate added marginal value can mitigate having to acquire non-productive capital assets to minimize the risk of interrupting production. A common and critical operation at all refineries is hydrogen sulfide (H2S) removal from hydrogen-rich streams. This operation is performed as part of hydrotreating processes seen with hydrocrackers (HDC) or hydrodesulfurization (HDS) units, as well as with natural gas sweetening units. The liquid-gas effluent mixture from the fixed bed catalytic reactors is characterized by a gas phase containing H2S, the product of the desulfurization reaction. The hydrogen-rich gas can be recycled to the reactor only after removal of the H2S. This operation is performed in a scrubber where the gas is contacted with an H2S sequestrating solvent, generally a water solution of monoethanolamine (MEA), methyldiethanolamine (MDEA), diethanolamine (DEA) or diisopropylamine (DIPA). The solvent is then processed in a reboiled regenerator where solvent and H2S are separated in order to re-use the lean amine in the scrubbing operation, as shown in Figure 1. The H2S scrubbing efficiency of the sour gas is critical for the desulfurization reaction yield, as well as for limiting the corrosion of the compressor downstream from the scrubber. It is critical to maintain low H2S concentration in natural gas operations due to its toxicity and environmentally polluting combustion products. How performed the part of hydrotreating processes... Log in or register to read the rest of this comment. This is a great article. Any discussion on amine... Log in or register to read the rest of this comment.